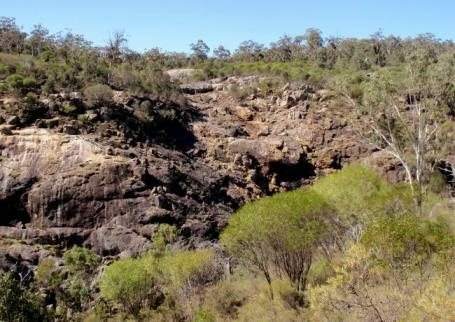 This walk takes in some of the rugged scenery of the Avon Valley National Park on the south side of the Avon River. The uphill climbs are rewarded with some excellent views across the main valley and side valleys. The route includes an optional diversion to an historic cairn placed by John Forrest’s survey team in 1878. 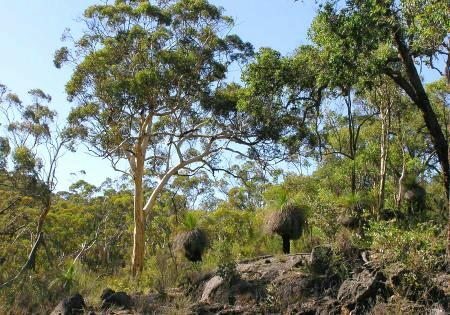 This walk on the south side of the Avon River in Avon Valley National Park is more challenging than the alternative South Side Variation Walk: It is longer (17km versus 15.5km) and has more off-track walking (85% versus 70%). There is less than 3.5km (~20%) overlap between the two walks and this walk starts from Homestead Campsite rather than from Bald Hill Campsite. The walk takes in some of the rugged scenery of the Park. 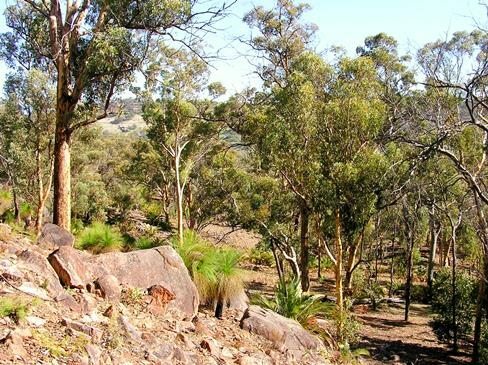 The River runs southwestward through the park, cutting deeply into the granite of the Darling Range (as it has also done about 20km further SW at Walyunga National Park, where it becomes the Swan River). The steep slopes of the Avon Valley and its side valleys provide for some good views. Western Australia’s pioneering surveyor-explorer, John Forrest (later a Premier of W.A.) and his surveying team in early 1878 placed cairns on several observation points near the hill-tops overlooking the valley. This walk includes an opportunity to capture some sense of that history by including an optional diversion to the Cairn “OS” site. 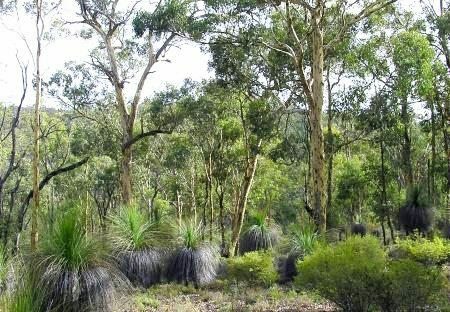 Together with Walyunga National Park and Paruna Wildlife Sanctuary to the SW, the Park is now an important area for native fauna conservation along the Swan-Avon Valley. Animals re-introduced by DBCA – Parks and Wildlife/AWC include the tammar wallaby, black-flanked rock wallaby, the quenda (southern brown bandicoot), and woylies (bettongs). In recent years however, in the absence of serious culling, feral goats have reached damaging, plague proportions in the Park . Shorter walk options: The walk can be easily shortened to 14km by following two easy on-road/on-track options described in the Route notes. Two-day visit: A good option is to spend a weekend in the National Park, arriving Saturday morning and leaving Sunday afternoon. Camp at the Homestead Campsite. 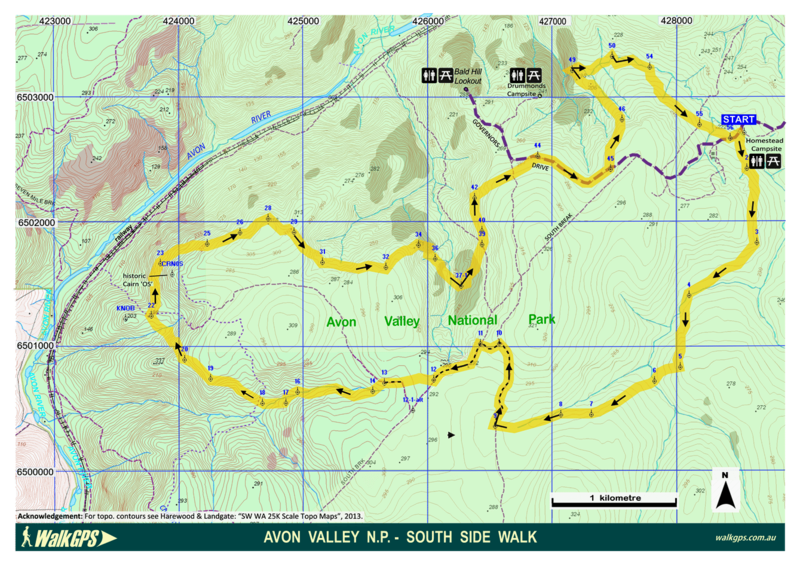 Do the Avon Valley – Both sides Walk on Day 1 and then this walk on Day 2. There is no significant overlap between the two walks, but both start conveniently from the Homestead Campsite. The Valley Campsite (at waypoint ‘VALL’) provides an alternative good camping option for this walk. It is much closer to the River and easily reached via waypoint ’33’, about 4km before the end of the walk route. 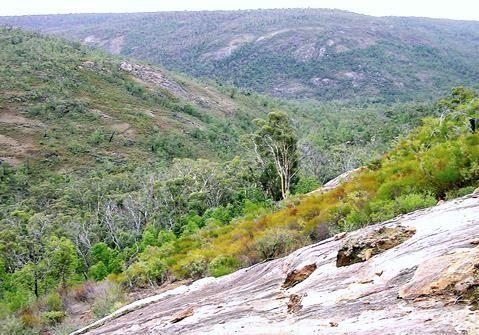 Other opportunities: Much of the western area of the Park, west of Joe’s Cage, is less easily accessible, and is quite rugged and challenging in places, especially between Plunkett Rd and the Avon River, with some dense, scratchy shrublands, but it also has potential for some good walking. Access is possible from Great Northern Hwy, via Chittering Rd (from Bullsbrook) and Wilson Rd, then into the Park along unsealed roads (Smith Rd and Plunkett Rd). These unsealed roads are quite rutted and rocky in places and more suited to 4WD. However, a little further north on Chittering Road (14km from Bullsbrook) the “Peace Be Still” Guest House/Retreat provides easy access to walking at the westernmost fringes of the Park, above the Brockman River and Chittering Valley (e.g. Kyotmunga Walk Trail and ‘Out & Back’ Walk; see Other info. on this site). Start from the Homestead Campsite (waypoint ‘START’). Cross the nearby stream course at about ‘1’ and then climb gently southward up and along the hillside through open wandoo-dominated woodland and low heath and cross a side gully at ‘2’. (Or see Option 1 below to bypass the initial 4km section which has become denser and more scratchy following re-growth after control burns). After almost 1km (at ‘3’), veer right (SW), initially along slope and then gently downhill to reach a stream course after about 700m. Veer left (approx. south) to cross the stream course (at about ‘4’) and climb gently for 500m through mixed forest to reach a stand of tall wandoo trees (at ‘5’) near the ridge. Veer sharp right (~WSW) and descend to soon cross another stream course, then climb gently and then along slope through mixed forest and some shrubland. Veer west at ‘7’ to soon reach an area of shrubland and balgas and then (at ‘8’) a broad sandy stream course. Follow upstream along the valley floor and meet a N-S vehicle track at ‘9’. Turn right to follow the road north for 600m, then turn left at ‘10’ onto an older vehicle track to follow it approximately west for only 150m to meet another South Break (firebreak vehicle track) at ‘11’. (Note: Be cautious if considering taking a short-cut route from ‘9’ direct to ’12’: That possible option shortens the walk by about 500m but likely passes through quite dense and scratchy dryandra shrubland, and progress will be slow and uncomfortable unless a recent burn happens to have temporarily lightened the vegetation.) Turn left (SW) at ‘11’ and follow South Break for 500m then turn right at ’12’ to head westward off-track to meet a vehicle track at ‘12-1’. (Alternatively, if the off-track section ahead at ‘12’ also appears too overgrown, stay on South Break to detour on-track via ‘12-1-alt’ to reach ‘12-1’.) Turn right at ‘12’ to follow the joining vehicle track road initially NNW and then west. Veer left off the road at ’13’ to head downhill to cross a stream course at ‘14’ and reach a small low outcrop surrounded by fairly tall heath. Veer west to head down the valley keeping quite close to the south side of the stream course for about 500m toward ‘15’. You will now cross the stream 3 times over the next 300m to follow the easiest route downstream. i.e. Cross the stream course to ‘16’ to avoid denser shrubland on the south side, but soon re-cross to ‘17’ on the south side and again to the north bank to cross a vehicle track upslope at ‘18’. Then climb ~WNW quite steeply to reach the edge of a laterite-capped ‘plateau’ surface after about 400m. Continue WNW, following the edge of the plateau to ‘20’, then descend a steep rocky slope to cross a deeply-incised stream at ‘21’. Climb for a short distance through open woodland to a saddle (at ’22’) in very open woodland. This is approx. the halfway point on the walk. 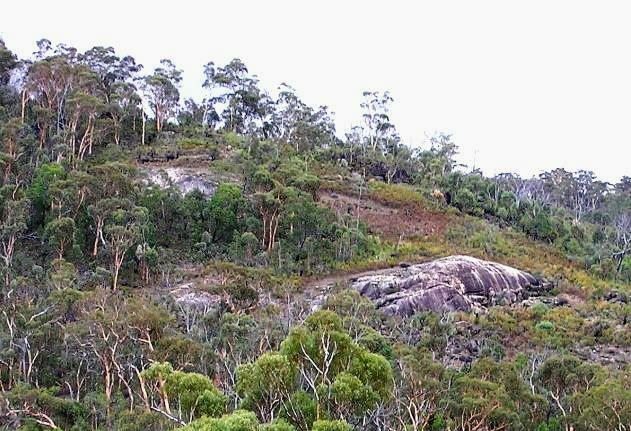 (Note: There is a small forested promontory immediately to the west of the saddle, with the high point, the ‘KNOB’, about 200m west of ’22’; but the very limited views from that point are disappointing.) From the saddle, head approx. 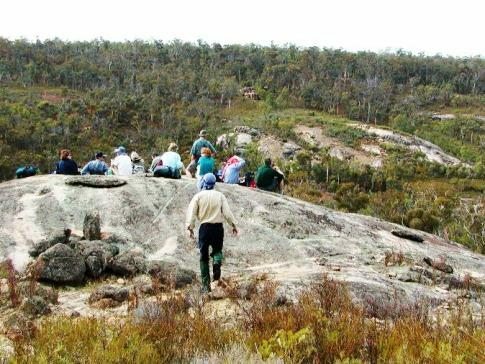 northward and climb gently along the steepening rocky slope, following a well worn animal trail (sadly the ample ‘scats’ evidence indicates this is mostly from feral goat traffic rather than kangaroos) and gaining views across the Avon Valley. (See Option 2 below for possible diversion to visit historic Cairn “OS”.) – If feeling energetic, at about ’23’ you can opt to take a short, 150m detour steeply uphill toward the SE, off the main route, to visit the location at ‘CRN0S’ of Cairn “OS”. 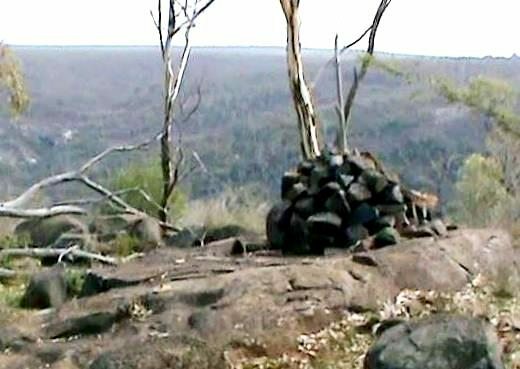 This was one of several cairns placed by John Forrest’s surveying team in early 1878 on observation points overlooking the valley. The current small rock cairn is up a steepish slope, and is located on a small outcrop, just south of a larger dolerite outcrop. For safety during the uphill climb from ’23’ veer around the north side of the steep dolerite rock outcrops. 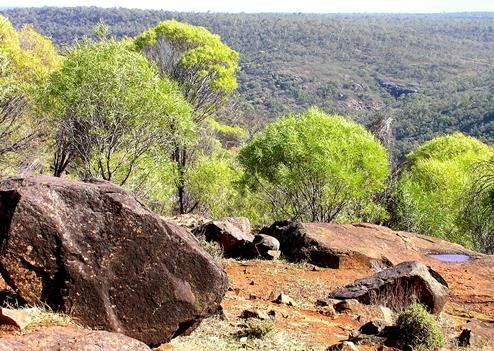 When leaving the cairn, don’t descend to rejoin the main route immediately, but instead head direct to ’27’, mainly along-slope for easy walking through very pleasant open wandoo woodland.) If staying on the main route, at ’23’,veer NE and continue mainly along slope to ’24’, then veer more eastward to climb gently across the slope (via ’25’, and ’26’) to ’27’ which is just downslope from the edge of the laterite plateau. At ’28’ veer right (SE), along slope and soon climb onto the laterite surface, passing from the very open woodland on the slope into dryandra shrubland on the plateau. Pick an easy route through the Parrot Bush via ‘29’ and soon descend SE via ‘30’ back into woodland around the flanks of the plateau. 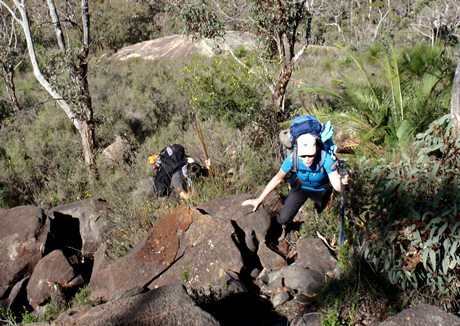 At ’31’, veer eastward near a stream gully and continue initially along slope through wandoo woodland before climbing back up onto another flat laterite-capped ‘plateau’. Continue eastward through heathland along the northern edge of the plateau to ’32’. Then veer NE and soon begin descending via ‘33’through forest and heath. Continue descending, and partly scarmblinmg, down a steepening, partly rocky ridge via ‘34’ to a small but prominent granite outcrop at ’35’. This provides good eastward views across the side valley and a northward view toward Bald Hill and is a good spot for a rest stop. Then veer approx. SE to descend (via ’36’) through forest and heath. Cross a N-S stream gully at ’37’. 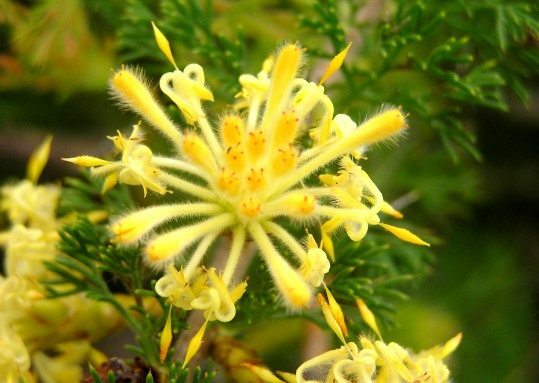 Then climb initially SE-ward through fairly thick shrubland and heath to a small outcrop at about ’37-1′. Follow the outcrop upslope via ‘37-2’, then veer left (NNE) initially along slope to cross more rocky outcrops and heath. Continue NNE via ‘38’ (from where there is a good view west back across the side valley) and soon cross a vehicle track at ‘39’. Veer ~NNW along the hillside via ‘40’ and ‘41’, mostly following a kangaroo trail slightly downslope. Reach a steeply sloping granite outcrop at ‘42’ with a view NNW down the side vallley to Avon Valley and another good spot for a rest stop. Veer right to climb initially quite steeply NE through shrubland and over rocky ground. Soon reach the flatter laterite surface and continue NE for about 500m through shrubland, crossing an old vehicle track at ‘43’ before reaching Governors Drive (at ’44’). Follow Governors Drive eastward for about 700m to ’45’. (See Option 3 below for possible shortened walk from this point.) Veer northward offtrack at ’45’, soon descending more steeply through forest and shrubland to ’46’. Then veer NW initially through woodland and then heathland, gaining some views across the side valley. Near ’48’ reach a granite outcrop. Veer left to descend the outcrop to reach within 40m a rocky stream gully (at ’49’). (A short diversion of about 100m westward down the gully from this point would take you quite close to the top of Emu Springs Falls. The falls drop about 30m but are hidden from sight from this position and the sheer granite rock faces make any closer approach from this direction too dangerous. (Note: The Falls can best be viewed, from a separate, short but steepish walk along a rough foot-track from Drummonds campsite which is reached off Governors Road.) Follow the stream course upstream eastward along the bank via ‘50’, ‘51’, ‘52’ and ’53’ finding an easy route through the mostly fairly open shrubland and open forest. Cross a granite ledge along the stream course at ‘53’ and veer right (SE) at ‘54’ to leave the gully. Initially climb gently SE-ward via ‘54-1’ through heath and open woodland and then walk along slope to cross South Break vehicle track at ‘55’. Veer left (ESE) and cross a narrow gully at ’55-1’. Continue ESE to soon meet Governors Drive (at ’56’). Turn left to follow Governors Drive for only 100m to return to the Start point at the Homestead Campsite. Option 1, to bypass initial, mainly off-track section: The vegetation along the initial 3.5km of the route has become denser and more scratchy due to vigorous understorey re-growth following control burns in recent years. You can bypass this section by simply following Governors Drive westward to South Break track, then follow South Break track SW to waypoint ‘11’ to continue along the described route from there. That’s a few initial kms of on-road and on-track walking, but will also shorten the walk by about 1.5km. Option 2 for possible diversion to visit historic Cairn “OS”: If feeling energetic, at about waypoint ’23’ you can opt to take a short, 150m detour steeply uphill toward the SE, off the main route, to visit the location at ‘CRN0S’ of Cairn “OS”. This was one of several cairns placed by John Forrest’s surveying team in early 1878 on observation points overlooking the valley. The current small rock cairn is up a steepish slope, and is located on a small outcrop, just south of a larger dolerite outcrop. For safety during the uphill climb from ’23’ veer around the north side of the steep dolerite rock outcrops. When leaving the cairn, don’t descend to rejoin the main route immediately, but instead head direct to ’27’, mainly along-slope for easy walking through very pleasant open wandoo woodland. Option 3 for shortened walk (after waypoint ’45’): From this point, if you prefer to shorten the walk by about 1.5km, simply continue eastward along Governors Drive for ~1.3km back to the Start point. This option overlaps with part of the on-road walking in Option 1 (in opposite direction). Great Eastern Hwy and bypass, then north on Roe Hwy, then approx. 48km NE along Toodyay Rd to signposted turnoff to Avon Valley National Park on left (Morangup Rd), then about 5 km to Park entrance road on left. A Park entry fee applies. Follow the gravel road for about 8km, passing Quarry Rd (‘No Entry’) on the right, to reach a fork in the road soon after. Take the left fork which is Governors Drive and is signposted “to Bald Hill”. (The right fork which is Forty One Mile Rd, is signposted “to River”, and ends at the Valley Campsite near the Avon River). Follow Governors Drive for less than 1.5km and turn left into the signed Homestead Campsite and park in the camping area. (Public toilet close by). Park opening-closing times are 8.00am-5.00pm. Make sure you finish the walk in time to leave the Park by 5.00pm before the entry gate is closed. Take care driving on the narrow and gravelly Park access roads, and watch for kangaroos and emus crossing. Homestead Campsite (at walk start point). Bald Hill Campsite (end of Governors Drive, 800m from waypoint ‘44’). Drummonds Campsite (vehicle access: 900m from waypoint ‘44’ via Governors Drive then sidetrack). Via South Break (vehicle track) which runs SW-NE through the centre of the walk area and meets Governors Drive. Also, in the west a vehicle track heads approx. NW from near ‘22’ for about 500m down the steep valley slope to meet the vehicle track along the SE side of the railway embankment. The railway service road (along the NW side of the railway embankment) can then be followed NE for about 6km to Forty One Mile Rd (below Valley Campsite). 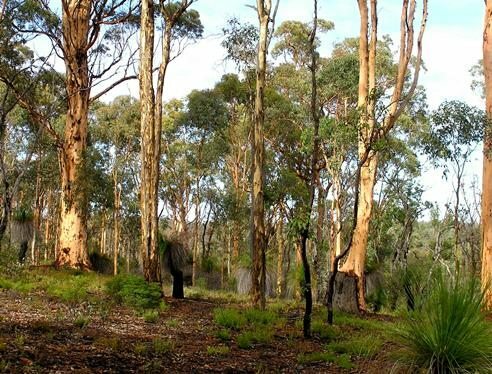 “Avon Valley National Park”, DBCA site. – Includes a downloadable Park Guide and Flora & Fauna Guide. “Avon Valley Survey Heritage Trails: recognising the pioneering achievements of 19th century surveyor/explorer, Lord John Forrest.” – Undated former Department of Land Administration, Mapping & Survey Division publication (two maps on one double-sided A4 sheet. Copy provided to me by the Park Ranger but original also available in W.A. State Library map collection at Battye Library; Call # 9022.H65E635.) 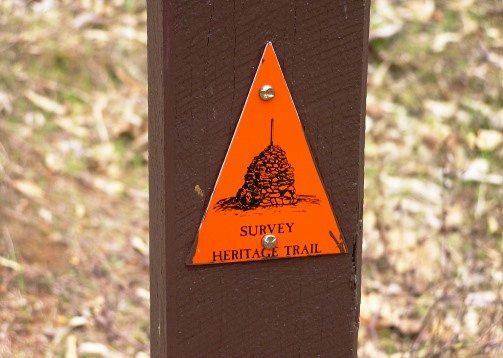 Some short sections of the “Survey Heritage Trails” network are followed on the route described on this page and you will find red-orange trail markers and also information boards at a few key points (including at the Homestead Campsite entry, at “Joe’s Cage”, and at historic Cairns “DP” and “GR”). Some other sections of the original trails are across very steep and difficult slopes (not on this route, and not recommended!) where the trail is no longer maintained and has been overgrown and lost in dense shrubland. “Bushranger Country: Avon Valley National Park”, John Hunter, in Landscope magazine (CALM), Vol.14, No.2, Summer 1998-99, pp.10-15. – Article mainly about Moondyne Joe. Canoeing in Western Australia, Robyn Khorshid site. – For a kayaker’s perspective of the Avon Valley i.e. the “Avon Descent”, including some great “Paddlers’ Stories”. 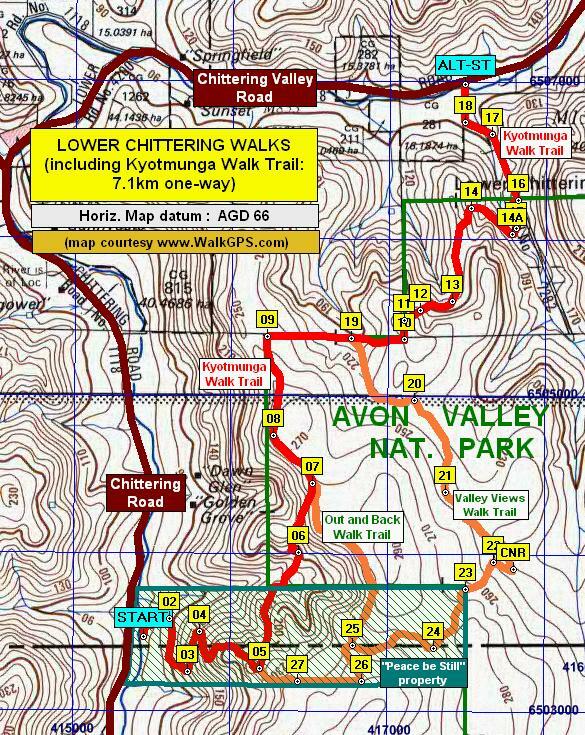 “Kyotmunga Walk Trail” – A 7km point-to-point trail; access in south from “Peace Be Still” car park off Chittering Rd, and in north from Yozzi Rd off Chittering Valley Rd (initial section is signed as ‘W’ trail through citrus orchard). Lies mainly within the NW-most area of Avon Valley National Park. Regarded as one of the best on-track trails in the Shire of Chittering. 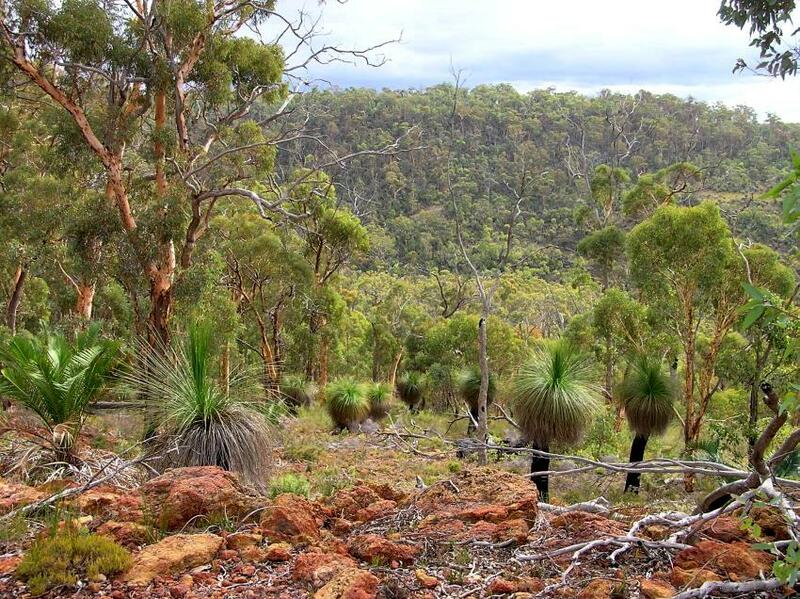 Passes partly through wandoo woodlands and provides views across Chittering Valley. See also WalkGPS map including other Lower Chittering area trails. Landscope magazine, CALM, Spring 2004 – Included article on CALM/AWC collaborative work to restore wildlife to the Swan-Avon Valley. “Perth Rock Climbing Guide”, Climbers’ Association of W.A., 2010 (2nd ed.) – Includes a climbers’ perspective of the Avon Valley. “Travellers guide to the Parks & Reserves of Western Australia”, Simon Nevill, 4th Edn. 2011, p.41 (Simon Nevill Publications) – Includes a brief summary of the Park. “South West WA 25K Scale Topo Maps”, Greg Harewood & Landgate, 2015. – Digital raster; ECW format on 16GB USB. See tiles #329-2134-IV-NE and #326-2134-I-NW for relevant map coverage. Just to clarify Ras’ walk was actually the ‘Both Sides’ walk not this south side walk (comments were mis-posted to this page), whereas I think you did this South Side Walk. I’ll delete his comments here to avoid confusion. 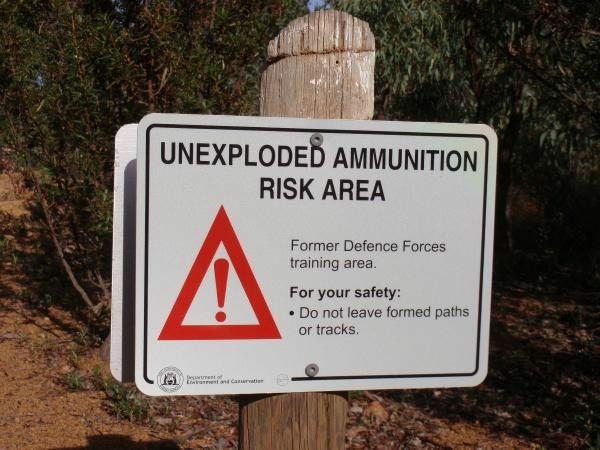 Unexploded Ordnance (‘UXO’) – Avon Valley National Park was the site of a former Department of Defence Artillery Training Area (1958-1966) and may still be contaminated with unexploded mortar bombs and artillery projectiles. UXOs have been found in the past. Park signs alert walkers to the Risk Areas. Off-track walking is allowed through the area and there is negligible risk provided walkers do not attempt to touch, handle, remove, or disturb in any way any UXO (or suspected UXO) that they may rarely come across. Any ordnance found must be treated as extremely dangerous. Without disturbing the object or immediate vicinity, the site should be clearly marked (e.g. with flagging tape or small rock cairn) and a GPS location obtained, or the site marked on a map if available. The location must then be reported to the Park Ranger or nearest Police Station a.s.a.p. View across side valley from laterite-capped hilltop. 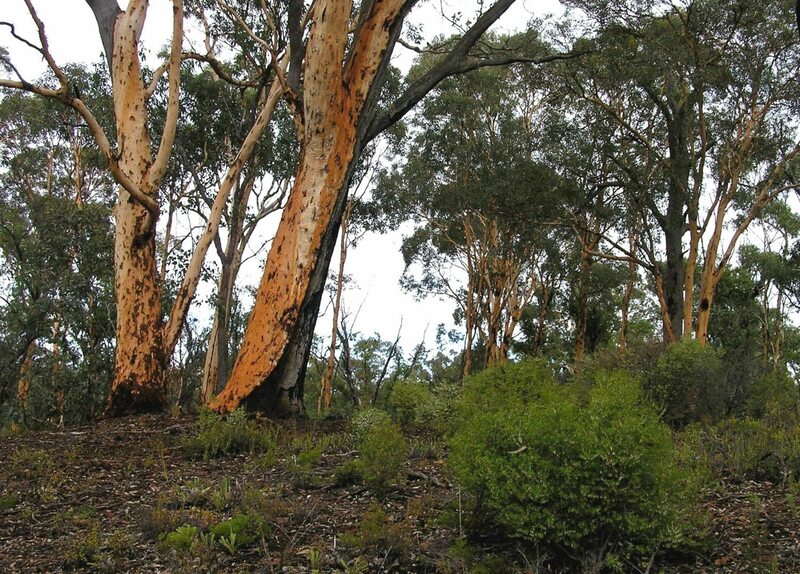 Wandoo woodland near Homestead Campsite. Walkers rest on outcrop in side valley near Bald Hill. 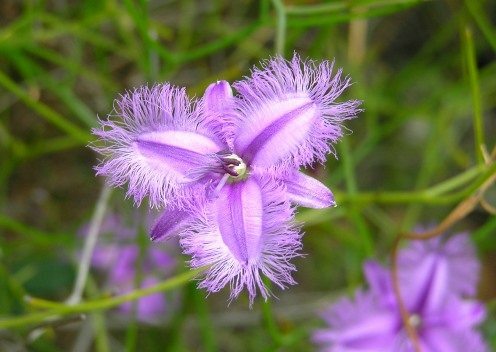 Climbing Fringed Lily (Thysanotus patersonii). Outcrops in side valley near Bald Hill. Walkers scrarmble up dolerite dyke south of Bald Hill. Historic Cairn 'OS' placed by John Forrest's survey team in 1878. Woodland on east side of Avon Valley. 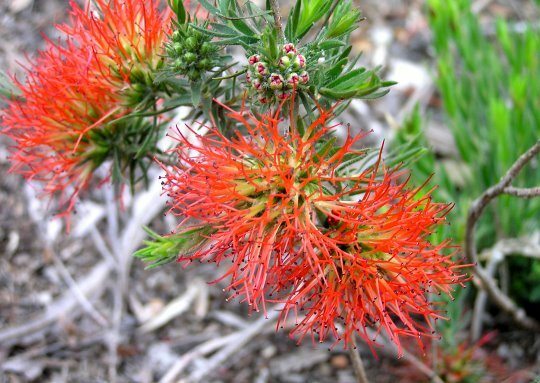 Darling Range Beaufortia (Beaufortia macrostemon). 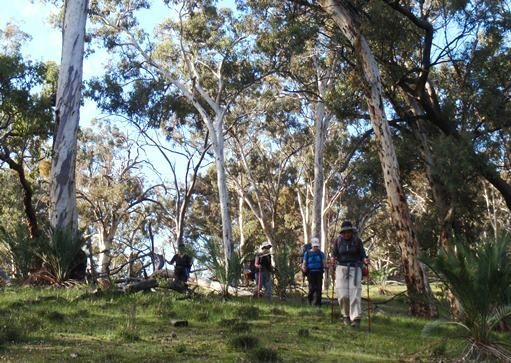 Walkers in wandoo woodland below Cairn 'OS'. View down side valley to Avon Valley. 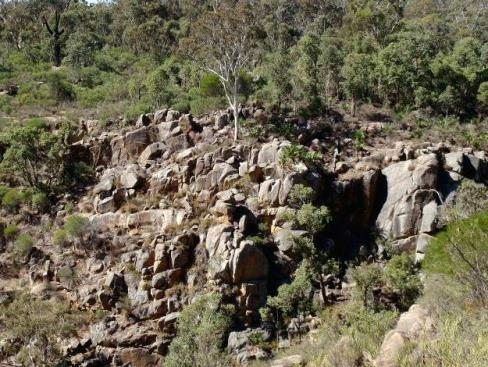 Granite outcrop near Emu Springs Falls (from below Drummonds Campsite). View to Emu Springs Falls - not flowing (from below Drummonds Campsite).